WASHINGTON — New polls in three key Midwestern states show Republican Senate and gubernatorial candidates trailing their Democratic counterparts in hypothetical matchups — particularly GOP Gov. Scott Walker in Wisconsin, where only a third of voters say he deserves to be re-elected and where he trails his leading Democratic challenger by more than 10 points. 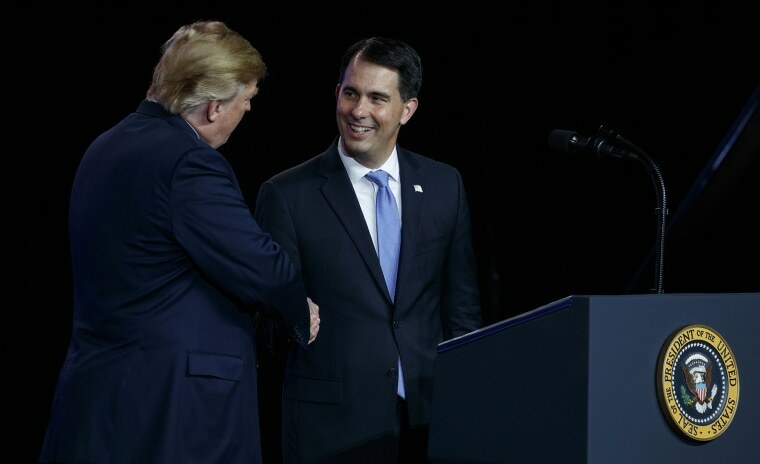 According to new polling from NBC News and Marist, just 34 percent of Wisconsin’s registered voters say Walker should win re-election in the fall, while 61 percent say a new person should be given the chance to lead the state. The crowded Democratic field to take on Walker has a clear frontrunner in state schools superintendent Tony Evers. Among likely voters, Evers received 26 percent support, while the nine other competitors in the race registered in the single digits, with Kathleen Vinehout (7 percent) and Mike McCabe (another 7 percent) as Evers’ closest competitors ahead of the August 14 primary. Those margins were nearly identical when all potential Democratic voters are polled. If Evers faces Walker in the general election, the poll shows the Democrat would start the contest with a significant advantage. Evers leads Walker 54 percent to 41 percent in a hypothetical matchup among registered voters. But either GOP Senate candidate trails Democratic incumbent Baldwin by double digits in a head-to-head matchup. Against Nicholson, Baldwin enjoys a lead of 54 percent support to 39 percent support. It’s a similar advantage for Baldwin against Vukmir, 55 percent to 38 percent. Among likely voters ahead of the Aug. 7 primary in Michigan, Republican John James leads rival Sandy Pensler in the GOP Senate contest to take on Democratic Sen. Debbie Stabenow, 30 percent to 23 percent, although close to half — 45 percent — are undecided. But the winner of that primary will face an uphill battle in the general election. In a hypothetical head-to-head contest, Stabenow leads James 55 percent to 37 percent among registered voters, while the incumbent Democrat leads Pensler 52 percent to 37 percent. In the governor’s race, Democrat Gretchen Whitmer and Republican Bill Schuette lead their respective primary fields. Whitmer, the former minority leader in the Michigan Senate, has the support of 35 percent of likely voters, compared with 25 percent for businessman Shri Thanedar and 22 percent for Abdul El-Sayed, the former Detroit health department leader. When all potential Democratic voters are polled, it’s 31 percent for Whitmer, 27 percent for Thanedar and 22 percent for El-Sayed. Schuette, the state attorney general, leads the GOP pack with 36 percent support among likely voters compared with 26 percent for Lt. Gov. Brian Calley and 12 percent for state Sen. Patrick Colbeck. Those shares are nearly identical when all potential GOP voters are surveyed. In a hypothetical general election matchup, the Democratic candidate again has the advantage. Whitmer bests Schuette among all registered voters, 47 percent to 38 percent. With Minnesota’s gubernatorial primary looming on Aug. 14, Republican former governor Tim Pawlenty enjoys a substantial lead over Hennepin County Commissioner Jeff Johnson, while the top two Democrats duking it out for the nomination are neck-and-neck. As in the other states polled by NBC and Marist this month, though, the Republican gubernatorial candidate trails his Democratic counterparts in general election contests. In one-on-one matchups against either Swanson or Walz, Pawlenty currently registers at 40 percent to either Democrats’ 51 percent. The general election advantage is even wider for incumbent Democrat Tina Smith, who replaced Sen. Al Franken after he resigned amid a harassment controversy late last year. Smith leads GOP challenger Karin Housley 49 percent to 35 percent in a general election pairing. The live-caller NBC/Marist polls were conducted July 15-19 among respondents contacted by both landline and cell phone.